Good morning, did you hear we're launching a podcast today? Subscribe to Axios business editor Dan Primack’s 10-minute podcast here to get smarter, faster on the collision of tech, business, politics — and occasionally — energy and climate change. Now let's dive into the news. My latest Harder Line column picks up on a subtle but significant political shift: Climate change actually becoming a political worry for some Republicans. I'll share a glimpse of that, and then Ben Geman will get you up to speed on the rest of the news. 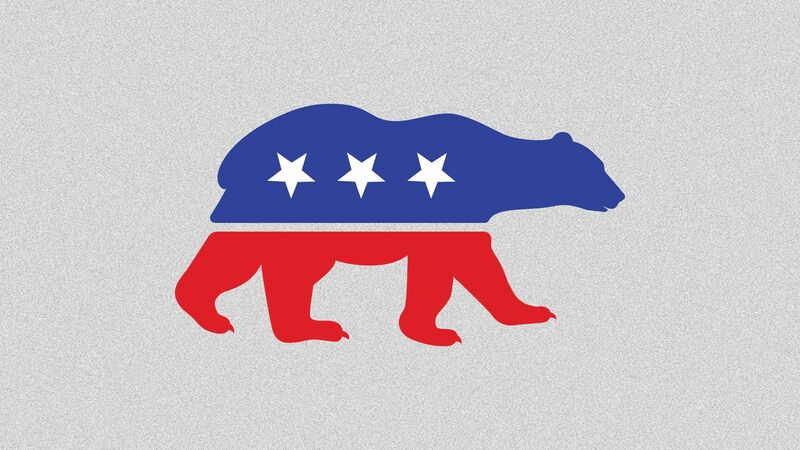 Climate change is starting to become a political worry for some Republicans. The big picture: For years, Republicans could ignore the issue or outright question mainstream climate science without political worry. That’s starting to change. Some congressional Republicans are beginning to find it in their political interest to at least acknowledge climate change and oppose efforts to weaken existing policies. The subtle but significant shift is fueled by disparate factors, including a stronger economy and President Trump’s dismissive policies on climate. What they're saying: Unlike the backlash Republicans face for disagreeing with Trump on many issues, Gray says his polling shows that most Republican voters don’t penalize their lawmakers for acknowledging climate change is real and a problem, even though Trump openly mocks it. This distinction comes despite the fact polling shows climate change remains a low priority for most voters, said Gray, who has done work for environmental groups. Reality check: This political shift is by no means universal, and it isn't leading to broad support for policies. It's one thing to acknowledge climate change is real, but it's another, big step to put forward policies, and so far Rep. Carlos Curbelo (R- Fla.), who is introducing a carbon tax bill today, is an outlier. GOP Reps. Steve Scalise of Louisiana and David McKinley of West Virginia sponsored last week’s anti-carbon tax resolution for compelling reasons: They represent fossil-fuel constituents who would get hit hardest by a tax on carbon emitted from oil, natural gas and coal. Go deeper: Read the full column in the Axios stream here. Crude oil prices are rising Monday after a charged exchange between Trump and Iran's leaders. The big picture: It's the latest sign that geopolitical tensions will keep fueling market volatility despite plans by OPEC and Russia to boost output. The global benchmark Brent crude is up over 90 cents in trading Monday to get back above $74 per barrel, while WTI, the U.S. standard, has gained around 85 cents to rise above $69 per barrel. Driving the news: Trump tweeted an explosive, all-caps threat directed at Iran's president Hassan Rouhani late Sunday. Trump's tweet, which has already drawn comparisons to his now-famous "fire and fury" threat against North Korea's Kim Jong-un, was prompted by comments made yesterday by Iranian President Rouhani. ICYMI: Rouhani yesterday had warned Trump, "don’t play with the lion’s tail" and that "America should know that peace with Iran is the mother of all peace, and war with Iran is the mother of all wars." In addition, Iranian leaders on Saturday threatened to try and stop crude exports from other countries in the region if its exports are thwarted. Per Reuters, Supreme Leader Ayatollah Ali Khamenei on Saturday endorsed a prior threat by Rouhani on the matter. Yes, but: There are several forces mitigating the extent of the price rise. For instance, analysts with Commerzbank note that new barrels from OPEC and Russia entering the market, as well as trade tensions and their potential downward pressure on demand, are limiting the price reaction to Trump's threats, the Wall Street Journal reports. 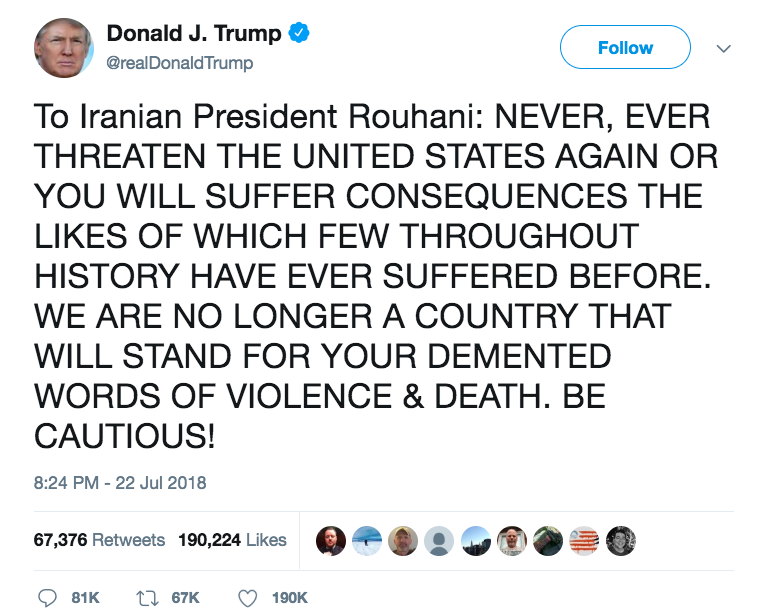 Go deeper: Trump's tweet and fury at Iran. Funding: Interior Department and EPA funding legislation is on the Senate floor. Sanctions: Secretary of State Mike Pompeo will appear Wednesday before the Senate Foreign Relations Committee. We'll be keeping an ear out for any comments on how much wiggle room on sanctions the administration may provide buyers of Iranian crude. DOE: The Energy and Natural Resources Committee will vote Tuesday on White House nominees for several senior DOE jobs. Geopolitics and prices: The same day, the Energy and Natural Resources panel will hear from experts on oil prices and geopolitics. Tariffs: Also Tuesday, a House Ways and Means subcommittee will delve into the exclusion process for steel and aluminum tariffs, which are a big worry for energy companies building and using pipelines and other infrastructure. Policy: E&E News reports that a long-awaited Trump administration plan to scale back vehicle mileage and greenhouse gas emissions rules is slated to arrive this week. Bloomberg reports that it's coming "as early as" this week. Why it matters: Obama-era rules requiring significantly tougher standards for model years 2022–2025 were a pillar of the former regime's climate and energy agenda. One proposal reportedly under consideration would freeze the standards in place in 2020 for a half-dozen years. The intrigue: Major automakers called the Obama-era mandates infeasible, but they've also signaled that they're not on board with freezing the rules in place. Money: Several of the world's largest publicly traded energy companies will reports their second-quarter earning this week — tallies that will reflect stronger crude prices in recent months. The big picture: "2Q is typically a seasonally weaker quarter for the integrated oils, but this time we expect a strong performance, building on that of the first quarter," HSBC Global Research analysts said in a note Friday. "During 2Q, we saw a confluence of higher crude prices, strong LNG spot (and of course oil-linked) prices, and in most regions healthy refining margins too," they said. Shell, Total, Equinor and ConocoPhillips report results on Thursday. Exxon and Chevron report on Friday. BP reports on the following Tuesday, July 31. Geopolitics: S&P Global Platts looks at new Capitol Hill efforts to impose sanctions against Russian energy projects. The report says,"These efforts, still in their early stages in the House and Senate, could increase investment risk in Russia's oil and gas sector and, potentially, hinder some export growth, analysts said." Electric vehicles: Tesla's stock is down in pre-market trading after the Wall Street Journal reported last night that the automaker is "asking its suppliers for cash back to help it become profitable. "The report is based on a memo viewed by the WSJ that the automaker sent to a supplier last week. Why it matters: the story notes that the requests "raise further questions about Tesla’s cash position, which has dwindled after it struggled to boost production of its first car designed for mainstream buyers, the Model 3. " What's next: the topic is likely to surface when Tesla hold its second-quarter earnings call next week. LNG: Bloomberg explores the risk that the growing U.S.-China trade war could spill into liquefied natural gas, which hasn't happened yet. "The impact of duties on LNG, the world’s fastest-growing fossil-fuel commodity, would be particularly felt as the U.S. strives to become the world’s biggest exporter of the fuel and China drives global demand in its push for cleaner energy sources," they report. Axios' intern Henrietta Reily reports ... A new nonprofit is launching today that seeks to use emerging digital technologies like blockchain to advance energy and climate-change goals by giving consumers greater control over their electricity use while cutting government regulation. The details: The organization — called the Energy Consumer Market Alignment Project (EC-MAP) — aims to reduce government regulation to help consumer demand shape the energy sector like it does food or clothing. The nonprofit was founded and is led by Tom Hassenboehler, who most recently served as a top energy adviser for the House Energy and Commerce committee. Michael Catanzaro, a top energy adviser to Trump until April of this year, will chair the Policy and Digital Advisory Board. The group is funded by the Keystone Policy Center, a centrist nonprofit based in Colorado. Why now: Harnessing information through blockchain, Internet of Things and artificial intelligence will "empower consumers to have more choices to meet their energy needs," Hassenboehler said in a statement. The group will work to identify the barriers that keep current markets from employing data-driven energy management and determine a more appropriate role for the government "in the era of energy digitalization." The American Petroleum Institute, the industry's biggest trade group, reported $1.76 million for the April–June period, a slight dip from the $1.81 million in Q1. Chevron reported $2.55 million, compared to $3.09 million in Q1. ExxonMobil reported $2.73 million, down from $3.14 million last quarter. BP reported $1.22 million, a drop from the $1.63 million in Q1. ConocoPhillips spent $460,000 on lobbying last quarter, well below the $1.15 million from the prior three months. American Fuel and Petrochemical Manufacturers, the big refining industry group, reported almost $828,000 — a slight boost.